Senior Advocate, Anil Divan, urged the Supreme Court to recall its consequential judgment on the Collegium, delivered in December last year, and finalise the revised MoA on appointments to Higher Judiciary on its own, as the stalemate between the Government and the Collegium on the revised MoA continues, without any solution in sight. Divan was a counsel for one of the petitioners in the NJAC case heard and decided by the Constitution Bench last year. 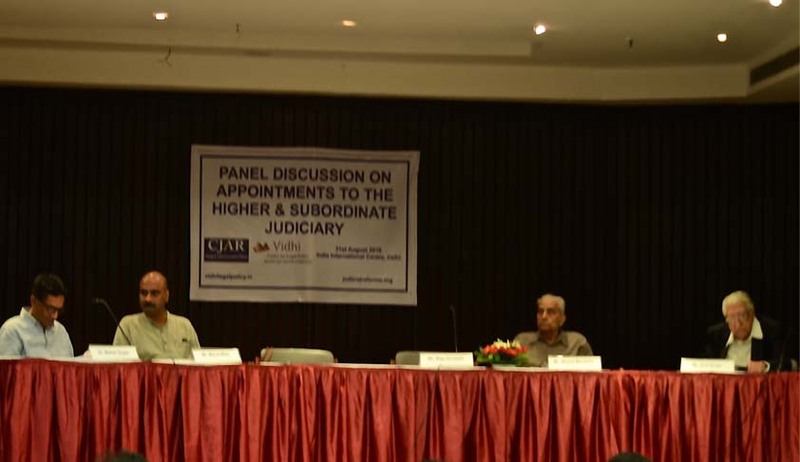 Divan was speaking at the panel discussion organised by the Vidhi Centre for Legal Policy and the Campaign for Judicial Accountability and Reforms on appointments to the Higher and Subordinate Judiciary, on August 31at the India International Centre, Delhi. Diverse stakeholders, including senior advocates, journalists, academics and activists formed part of the Panel. There was a general consensus among the panelists that the need of the hour with regard to judicial appointments, was bringing in a process of transparency in the manner in which these appointments are made. Further, the panelists agreed that the process of drafting of the Memorandum of Procedure for Supreme Court and High Court judges, which has been shrouded in secrecy, is to be condemned. While the collegium system for appointments suffers its flaws, it was suggested that to preserve the independence of the judiciary, the system of appointments would have to steer clear of interference from the political executive. What was also highlighted throughout the discussion was that, to ensure the system of judicial appointments is indeed one that ensures transparency and accountability, there needs to be a far wider and more effective consultation with the various stakeholders, which would have to go beyond just the executive and the judiciary. It was stated that the present system of appointments does not ensure a diverse judiciary and hence needs to be reformed to be able to reflect a system that leads to social justice and change. Criteria for appointment would have to go beyond merit and seniority to methods of evaluating integrity, character, judicial reasoning and understanding of law, coupled with a deep respect for the egalitarian principles as enshrined in our Constitution. The first panel on appointments to the higher judiciary was moderated by Ms. Maja Daruwala, the Director of the Commonwealth Human Rights Initiative, who remarked that the figure of 30 million cases pending before the judiciary was unconscionable and only worsens as the judiciary and executive tussle over the appointment process. Divan asked the executive and judiciary to make drafts of the MoP public. He suggested that if the MoP process is stalling appointments, the SC should amend the order that initiated it. He recommended that candidates should make public their applications, income, experience, seniority, and relations to sitting or retired High Court judges. He also stressed the importance of having an independent secretariat with complete control on the functioning of the appointments process. Shanti Bhushan, contrasted the state of the judiciary in the early years of the republic with its state now, when barely any High Courts can be found without allegations of corruption. He raised concerns over the practice of privileging seniority over merit, pointing out that many mediocre judges are appointed simply because they are more senior. He thus recommended the appointment of a full-time secretariat which would prepare lists of meritorious and incorruptible candidates suggesting that the secretariat could even be elected by the people, to democratize the process of judicial appointments. Surprisingly, he found nothing wrong in the interaction between the Law Minister and the Collegium Members. Senior journalist Manoj Mitta followed, focusing on the conflict over whether the judiciary should fall under the Right to Information (RTI) Act. He highlighted the opaque process of judicial appointments and the oft-whimsical functioning of the collegium, where worthy judges are passed over if they make orders unpopular with the Collegium, and candidates who have been proven to have misused their office are supported. He concluded that for the consumers of justice, the struggle over primacy between the executive and judiciary is not as important as that of transparency. Mohan Gopal, former Director of the National Judicial Academy and of NLSIU, Bangalore, returned to an analysis of the NJAC judgement, stating that it reflects the judiciary’s sentiment that the current executive is not committed to judicial independence. He pointed out how at present, the typical Indian judge is Hindu, upper class, upper-caste, and male, and that we need an appointment process which will change and democratize this to include judges from minorities, lower castes, economically deprived backgrounds etc. Senior leader in CPI (M), Nilotpal Basu, stressed again that without transparency in the process, it would have no credibility. He spoke of a disturbing trend in SC judgments, remarking that since 1991, they have been in alignment with the prevailing policy regime in the country. Nikhil Dey, founder-member of the MKSS and convenor of the National Campaign for People’s Right to Information, added a comment, about the need for public consultations, outside of the legal profession, since judicial appointments were too important a question to be left to the latter alone. The panel on appointments to the lower judiciary was moderated by Alok Prasanna Kumar, Senior Resident Fellow in the Judicial Reforms Initiative at the Vidhi Centre for Legal Policy. Senior Advocate Sanjay Hegde, who had appeared in the Third Judges’ Case, began by identifying the bureaucratization of the service industry as one of the greatest threats to judicial independence, stressing the dissonance between the objective answers that judicial service exams test and the problem-solving skills required of judges. He criticized the lack of institutional vision apparent in the length of terms of Chief Justices, too short for individuals to be able to make change. Scholar and NLU-Delhi Professor Aparna Chandra followed, highlighting how the lower courts are often not given their due importance in legal discourse, as is evident in their nomenclature as subordinate. Drawing on her experience working with the National Judicial Academy, she spoke of how District Judges, even in the 21st century, are often made to wait on High Court judges, given the immense control High Courts exercise over their promotion and transfers, and she thus recommended reducing this control. She spoke of diversity along caste and gender lines within the subordinate judiciary, citing the lack of available data on these metrics and a glass ceiling that potentially exists for women in the judiciary, who don’t have access to the same networks of power as their male counterparts. Paul Divakar, General Secretary of the National Campaign for Dalit Human Rights, picked up on Chandra’s points concerning diversity, citing the disproportionate incarceration of SC/ST communities; cases of serious discrimination faced by lower caste judges in lower courts, including physical violence, and being unable to approach a judge’s chambers without being accompanied by an upper-caste advocate; the reversal of judgements that punish perpetrators of caste atrocities; and the reluctance of judicial and police officers to recognize such atrocities as crimes. He thus recommended that training on diversity, social justice and fairness be inculcated in the curricula of the National Judicial Academy itself.